Note: Photo is generic and does not represent actual kit. Legendary Old Man Emu ride, handling AND off-road capability for your XJ Cherokee. 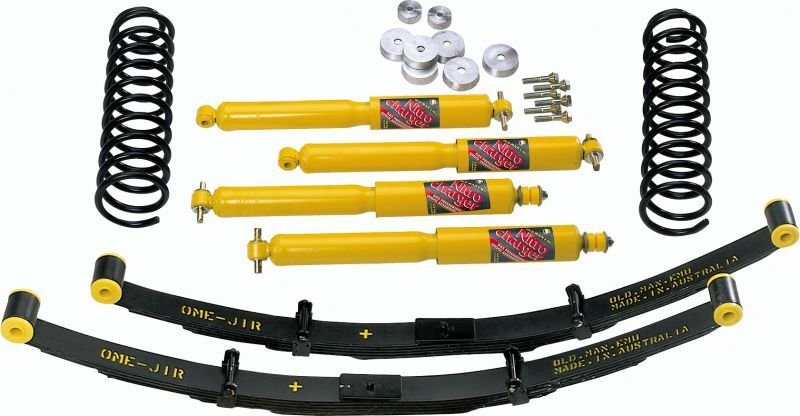 High Quality kit includes 4 OME Sport shocks, front OME coil springs, rear OME leaf springs, and a set of Rubicon Express Gen 3 Extreme-Duty swaybar quick disconnects! We can mix and match springs to meet your desired load capacity. Contact us for details on customizing the kit for your Jeep. * Depending on your vehicle setup it may be necessary to remove the 3rd leaf from the spring packs to lower the rear ride height 1/2" - 1". Note: OME leaf springs do not come standard with bushings, please see the rubber spring bushing kit under Lift Kit Options above.